Using Up the Scraps | ft. Simon Says Stamp "Beautiful Day"
Today I have one more card for my little Using Up the Scraps train. Is it just me, or when you get a new stamp set do you just stamp all the things then have no idea what to do with them? 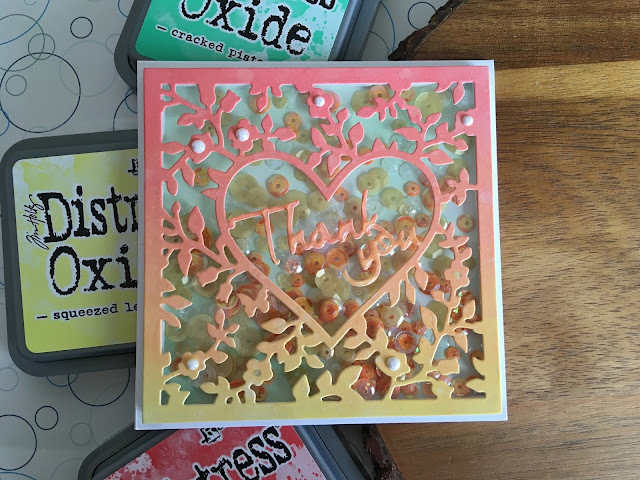 This is the third card this week where I have just used the ever-growing pile of bits and pieces that end up on my desk to make a card. It's a lot harder than you'd think. I get a new set and I have a million ideas and they don't just all come out neat and orderly, so I have pieces - everywhere. Pieces that had a destiny, but then real life takes over or I find that the idea in my head just doesn't translate to paper very well. Patterned paper is like that for me too. It's sooo pretty when I see it so of course I have to have it, then it kind of just sits there; sad and forgotten. For today's card I cut down a piece of that (oh so pretty) patterned paper I had laying around to fit the front of a standard A2 sized card base. I then used the three butterflies and the leaves that had also just been sitting around from Simon Says Stamp "Beautiful Day" set. They had been stamped with Memento Tuxedo Black ink on 110lb Copic-friendly cardstock, and coloured with Copic markers. These butterflies were originally intended for a Monochrome Monday card, but then I was at a loss for the background. It happens. The leaves and the two smaller butterflies were mounted flat to the base with my tape runner, and the larger is popped up with foam tape. To finish off the card, I added a scattering of purple sequins, not because they were just laying around, but because every card needs a little bit of shine. I hope you like today's card and are inspired to use some of your forgotten odds and ends. If you haven't already, please follow me on the right side bar, over on Facebook and on YouTube. Drop me a line in the comments section below and let me know what you think. Hippo Anniversary To You | ft. MFT "Happy Hippos"
Today I have a super fun anniversary card I created by request using the Happy Hippos stamp set by My Favorite Things and the "mirror stamping" technique. My mom asked me to create an anniversary card for someone she knew whose son was coming up to his first wedding anniversary. Naturally, I suggested something super romantic and had roses and lovey stuff all ready to go, and she's all like "nahhh, can you do hippos?" Yes. Yes, Mom, I can. It was awesome! I was so incredibly stoked that the lady wanted hippos instead of something lovey. So epic. To begin, I used the hippo with the gift from the Happy Hippos set and mirror stamped him. The original is the one on the right and the mirror is the one on the left. As I get more practice with this technique I love the results more and more. Kissing hippos? C'mon guy! How AWESOME is that? I trimmed the left edge down and added half an inch of teal paper to coordinate with the ribbons on the gifts; then coloured the images with Copic markers. The little heart is from MFT "Bitty Bears" and it worked out perfectly! All the images are stamped with Memento Tuxedo Black ink on 110lb Copic-friendly cardstock. I used a bit of Mowed Lawn Distress ink under the hippos just so they weren't floating in the middle of the page. To finish off the card, I used clear Wink of Stella over the hearts and the ribbons from the presents, then covered the hearts with Glossy Accents by Ranger. CAS Birthday Card - Using up the Scraps | ft. MFT "Beary Special Birthday"
Today, I have another card that I cobbled together with the bits and pieces left over from other projects. It's funny how they pile up. There's just one or two to start with and then before you know it, there's a whole dish full of these little bits on the desk. When I first got the Beary Happy Birthday set by MFT, I thought it would be wonderful to have them coloured as little pandas instead of my usual brown bears or polar bears. The problem was; I had never coloured a panda. So I stamped several and practiced, but then I didn't know what to do with them. So into the dish they went. I used a frame that was laying around and adhered that directly to the front of a standard A2 sized card base. I popped up the bear with the cake on some foam tape and mounted him in the corner. To finish off the card, I stamped the greeting from the same set. A New Baby to Love | ft. Lawn Fawn "Rub-a-Dub-Dub"
Today, I have a sweet baby card, created with the "Rub-a-Dub-Dub" stamp set by Lawn Fawn. This card came together with my little dish of bits from the dish on my desk. I tend to cut and colour more than I need so they end up in the dish. Every now and then the dish gets a little too full (or so I like to think) so I create mainly with what is in there, until it is down to a more respectable level. They have to fulfill their paper destinies, after all. To begin, I used the stamped images from Rub-a-Dub-Dub set and put them together in a little scene. The bubbles had been stamped on vellum, to attach them to the tub, I used just a small piece of scotch tape on the back, ensuring that it didn't come over the edge of the tub. It wouldn't do to have the tape showing. All of the images had been coloured previously with Copic markers. As such, they were stamped with Memento Tuxedo black ink on 110lb Copic-friendly cardstock. For the background, I used a couple scraps of patterned paper - this is another thing I can't seem to be able to get rid of. Even the tiniest of scraps end up back in the package. I adhered the tub flat to the front of the card and popped the mama duck and the banner up with some foam tape. 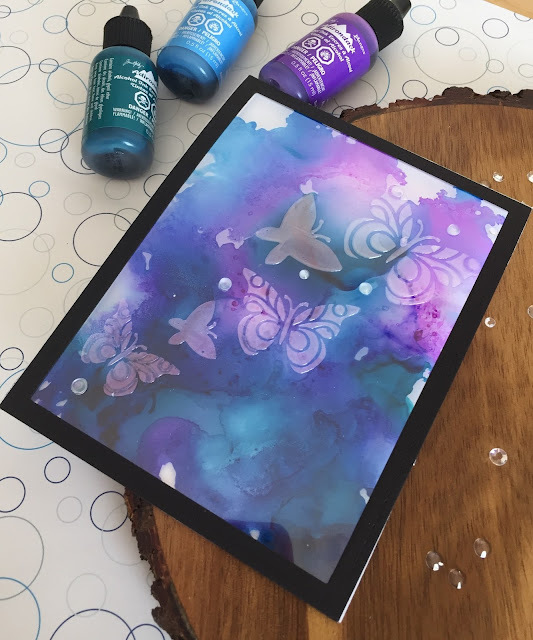 To finish off the card, I added some iridescent bubbles from Studio Katia, just to give it some extra shimmer. Embossed Vellum Overlay for Mother's Day | ft. Lawn Fawn "Flutter By"
Today I have a card (and video!) featuring a gold embossed vellum overlay on top of a brightly watercoloured background. This is pretty much how I imagined it in my head when it came to me. There are a few things I would do differently if I were to redo this card; chances are I will make another of these, it was just fun to play around with the watercolours. I think with a different colour palette, this technique could be used for pretty much any type of card. I'm looking forward to trying this in more earthy tones for a masculine card. I hope you like today's card (and Video!) and are inspired to create something of your own. If you haven't already, please follow me on the right side bar, over on Facebook and on YouTube! Drop me a line in the comments section below and let me know what you think. Today I have a super fun shaker using a new die, let me tell y'all: I had my doubts about this die. I haven't had the best luck with dies from Recollections, but this one impressed me. It's definitely the most intricate die that I have and it worked pretty well. If I had to remake this card, I think I would do something to make the text in the middle stand out a bit more, but live and learn, right? Don't get me wrong, I still like it, but just one of those things that I would do differently. Hindsight and all that. I hope you like today's card (and video) and are inspired to create something of your own. If you have't already, please follow me on the right side bar, over on Facebook and on YouTube! Drop me a line in the comments section below and let me know what you think. Sunset Hello | ft. Hello Bluebird Stamps "Silly Birds"
I decided to just play around before work so there's no video for this one, but so far I'm pretty impressed with the quality and they have some super cute stuff, I'm definitely looking forward to seeing what they come out with next. To begin, I stamped the flamingo and the leaves from the "Silly Birds" stamp set with Memento Tuxedo Black ink on 110lb Copic-friendly cardstock, then coloured them in with Copic markers. I die cut the panel and the background panel with some of Lawn Fawn's "Stitched Rectangles". The patterned paper is from one of my Coastal Village paper packs that I had show in a previous haul video. I adhered the patterned paper to the front of a standard A2 sized card base, then added the accent strip (conveniently it was the other side of the paper). I masked off my images and used Abandoned Coral, Dried Marigold and Mustard Seed Distress Ink to create a sunset background. I used a very light hand to add some Broken China Distress ink under the water. For the water panel I used the same small stitched rectangle to cut a piece of blue vellum, then used the small ocean waves boarder die from Lawn Fawn to die cut the top. 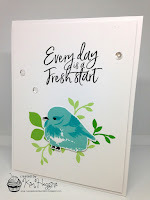 I prepped that with my powder tool and stamped the "Oh, Hello" from Hello Bluebird's "Spring Script" with VersaMark ink then heat embossed with detail white embossing powder. Finally, to finish off the card I added a 4mm googly eye from Studio Katia, just to add a little something - and it's super cute. I hope you like today's card and are inspired to create something of your own. If you haven't already please follow me on the right side bar, over on Facebook and on YouTube! Drop me a line in the comments section below and let me know what you think. 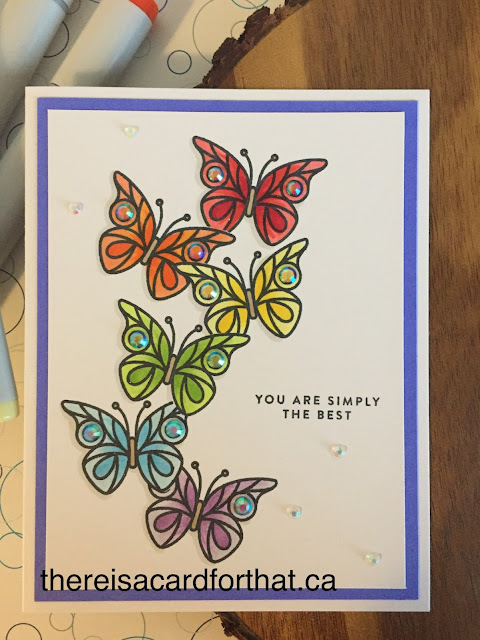 Butterfly Appreciation | ft. Simon Says Stamp "Beautiful Day"
Today I have a super quick Thank You card. A friend of mine is Chair of the Parent's association for her daughter's school, and she asked me to create a couple Administrative Appreciation cards for the ladies in the office. So while the video is quick, it took me a little bit to sort out the design (luckily I had some inspiration!). She wanted them in the school colours, and this was as close to teal as I could get. She likes them, so it's a win! The video only shows one, but they are basically the same. I supposed this would also technically fall into my monochrome series, but I haven't posted in a little while so I wanted to get this up right away, instead of waiting for Monday. Her CAS design with the bluebird really helped me out for my card today! Rainbow Butterfly Thanks | ft. Simon Says Stamp "Beautiful Day"
I'm finally back with another card and video - no Lawn Fawn this time! 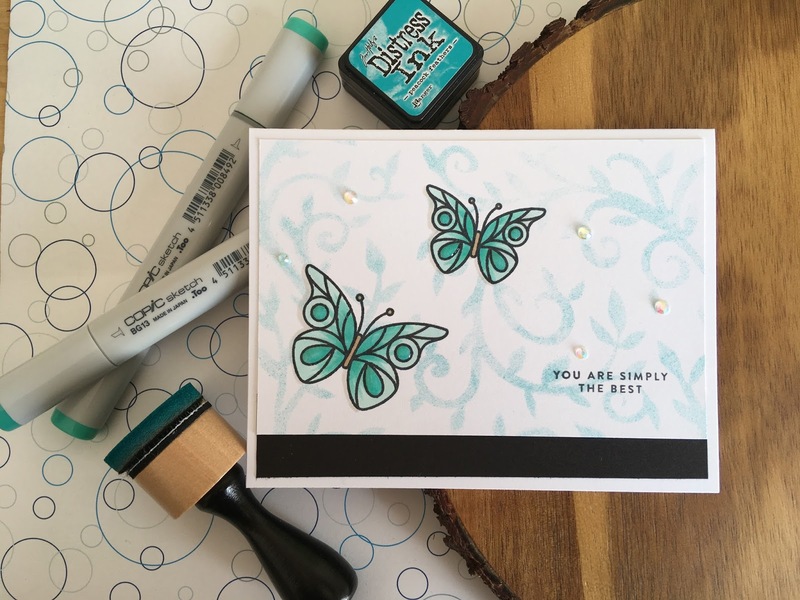 But I am using the "Beautiful Day" stamp set from Simon Says Stamp. I gotta say I am LOVING this set! I recommend watching in HD on YouTube! Check out the video to see how this card came together, the types of crystals I used and a complete list of the Copic markers used for colouring those butterflies! I opted to not put anything on the inside of this card while creating it, so that I could include a personal message for the recipient. This person is amazing, and I certainly would never have gotten through the week without her assistance. AHH! Just look at that shine! I can't even!! I hope you like today's card and video and are inspired to create something of your own. If you haven't already, please follow me on the right side bar, over on Facebook and on YouTube! Drop me a line in the comments section below and let me know what you think. Mother's Day Wishes | ft. Simon Says Stamp "Beautiful Day"
While I know it's a little early, today I have a lovely Mother's Day card featuring Simon Says Stamp "Beautiful Day" stamp set. I got this set in the April 2018 card kit, and though the kit is sold out, you can certainly still purchase the set individually. There is so much going on in this set, it is definitely worth a look. I had zero plan when I started out this card set, so there's no video. I kind of wish that I had filmed anyway because it turned out so wonderfully. To begin, I stamped the butterfly and the leaves with Memento Tuxedo Black ink on 110lb Copic-friendly cardstock and coloured them with Copic markers. 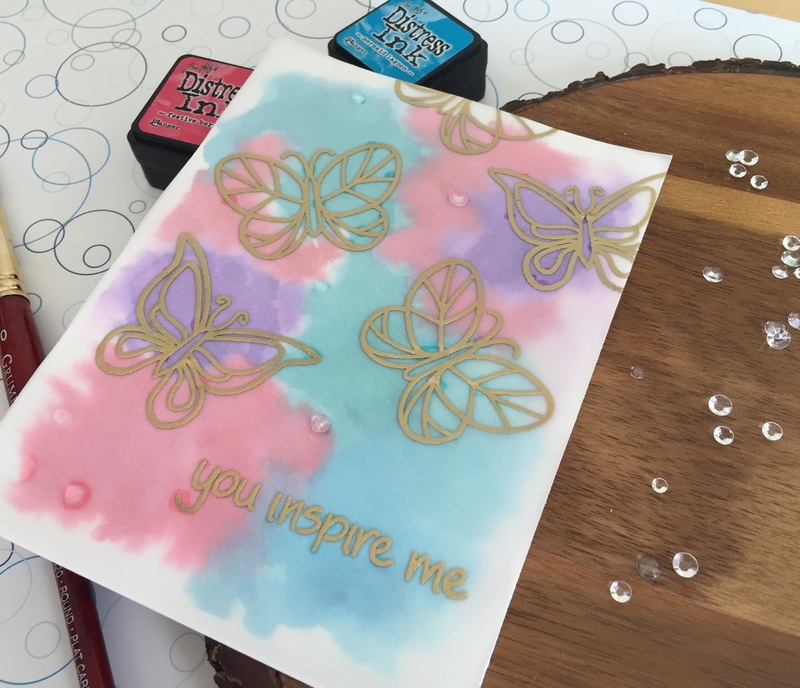 I cut two inch strips of cardstock in each of the colours that I coloured the butterflies, and used a lined stencil with the same colour ink to create a tone on tone patterned paper. Each of the cards is a top folding standard A2 sized card base made with the same 110lb cardstock as I stamped the images on. I stamped the greeting from Lawn Fawn's "Mom and Me" stamp set with Memento Ink. I used clear Wink of Stella over the whole of each butterfly, then used Glossy Accents by ranger over the darker dots and teardrop parts on the wings. Finally to finish off the cards I used some coordinating crystals from Studio Katia. 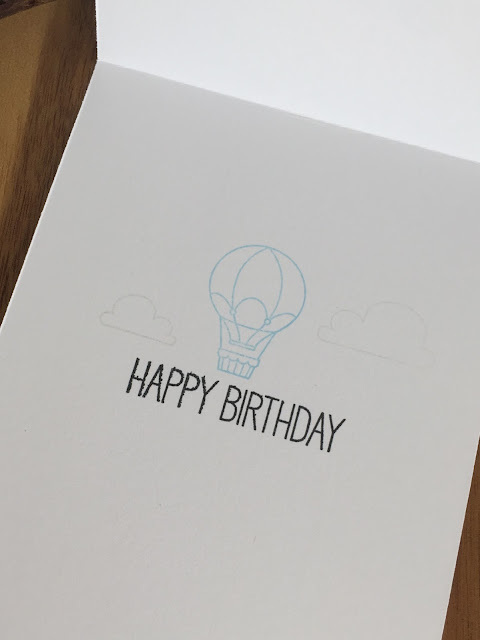 Today I'd like to share a birthday card I created using Clearly Besotted stamps and the no-line colouring technique with Copic markers. To begin, I stamped the tulips image from Clearly Besotted "Friends Forever" with CTMH Linen Ink on 110lb Copic-friendly cardstock. The Linen ink is incredibly light and nearly invisible once it has dried on the paper. It is also Copic-friendly (as long as you don't go crazy with your markers) making it the perfect ink for no-line colouring. I used a selection of yellow markers, starting with my darkest in the areas where I wanted the deepest shadows, then pulling the colour out with the middle shade then finally the lightest. I repeated the process for each petal, then went back after the entire bloom was completed to enhance the shadows as needed. I used the same technique for each section of the leaves and stems, I didn't want to colour all the dark areas or light areas first as I would lose the lines and it would just look like a blob. Once I was happy with the Copic colouring, I went over some of the areas with my Prismacolor Premier Pencils to add some fine detail. I masked off the floral images and smooshed some light blue ink on an acrylic block and watered it down. I then took a small fan brush and swooshed the blue back and forth across the background to create some interest. For my greeting, I stamped the Happy Birthday with a blue ink to really bring out the blue of the background as well as create a contrast to the flowers. I tied a piece of baker's twine around the front to create a bow, and then adhered the panel to a coordinating piece of shimmering cardstock. I then mounted the entire lot to the front of a top fold standard A2 sized card base. Finally, because I just can't stop myself, I adhered some iridescent crystals from Studio Katia across the front of the panel. So this is the second post/video for today because I really just couldn't wait. I had planned on posting this tomorrow, but that was just soooo far away and I'm really excited about it. There are a couple of new things that I've never before in this card. 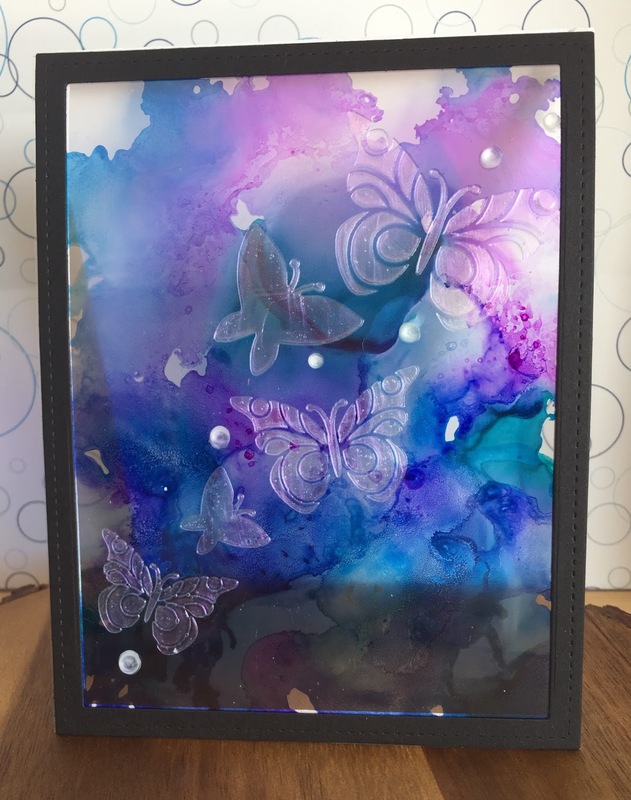 First off, I created an alcohol ink window for the front of the card, then second I used the Mother of Pearl Structure Gel by Daler Rowney on a second piece of acetate. I had no idea if either of these things would work, but I'm sure glad I turned the camera on just in case. I'm beyond happy about how this card turned out. Check out the video above to see how this card was put together! The structure gel dried a little more transparent than I had anticipated, but it still turned out super pretty! I did not do anything on the inside of this card because I didn't even know what type of card it was going to be. I'm sure when the time comes I'll be inspired. Today I have the unboxing of the Simon Says Stamp April 2018 Card Kit. Let me tell you guys, I was soooo excited when it finally arrived. The post took forever and it was making me so sad every time I went to the box and there was nothing there. I have so many ideas for this kit and I can't wait to post them. (I already have a video lined up and ready to go) but of course the unboxing has to go up first. The kit has been sold out, but you can certainly buy the pieces individually. The stamp set alone is worth having. It's BEE-U-TI-FUL!! I hope you like today's video. If you haven't already, please follow me on the right side bar, over on Facebook and on YouTube! Drop me a line in the comments section below and let me know what you think. Today I wanted to do a first look post. In my recent Haul Video, I showed some new ink that I had purchased from Michael's Craft store - the Craft Smart mini ink cubes - I believe that Craft Smart is one of their store brands - I've never seen it any where else - but I could be wrong. They are incredibly inexpensive - only $4 for a pack of 6, so I thought I'd give them a try. The worst that happens is I'm out four bucks, right? As I haven't really played around a whole lot with this product, this is not a full review, just a first look; I'm already surprised by the results! There wasn't a lot in the way of description on the packaging so even the type of ink was unknown. They just had some pretty colours. Please watch the video above to see the first look and initial trying out of this product! Overall, I'm pretty impressed with this product, especially for the price and I'll definitely be using it in my future projects! I hope you like today's video! If you haven't already, please follow me on the right side bar, over on Facebook and on YouTube! Drop me a line in the comments section below and let me know what you think! 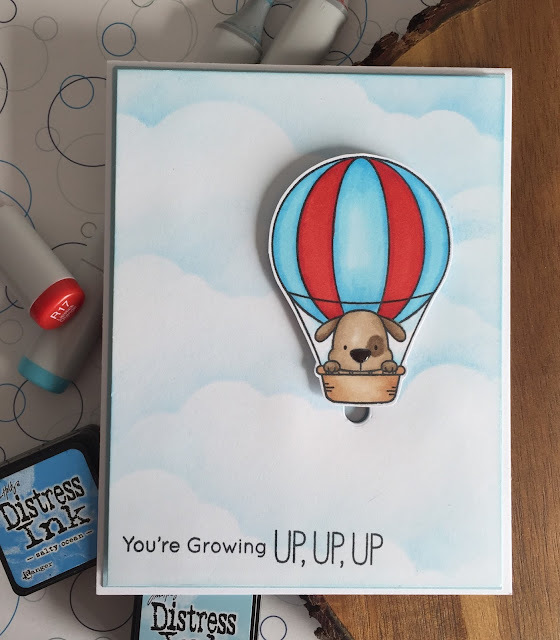 Simple Interactive Penny Slider | ft. MFT "Up In The Air"
Today I have a super easy interactive card that I created when my Sister In Law asked for a card for a little boy, I absolutely love making cards that are for specific people in mind because you can really tailor the card to the individual. Seeing the look on their faces when they see something they love is without a doubt one of the best feelings ever. 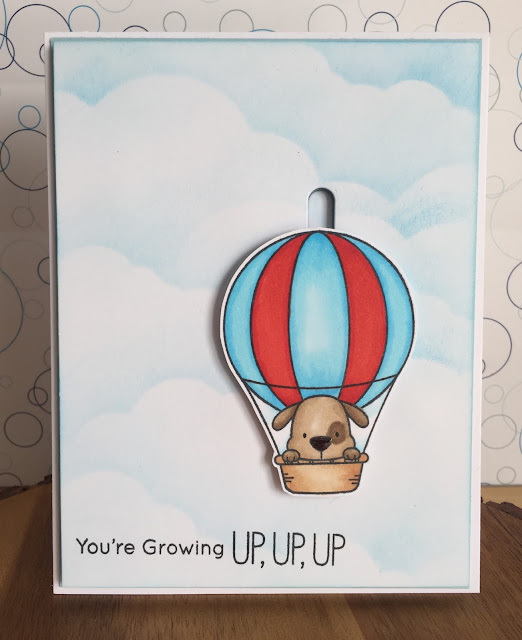 Click on over to YouTube and watch the tutorial video on how this card was put together, what I use for my cloudy stencil background and the list of Copic markers used to colour these images. I decided to add a couple additional images to the inside of the card just because it's so fun, and as you know it's one of my goals to start "finishing" the inside of the card! I hope you like today's card (and tutorial video) and are inspired to create something of your own. If you haven't already, please follow me on the right side bar, over on Facebook and on YouTube, drop me a line in the comments section below and let me know what you think!